Your trip back in time to the Antebellum South begins with pickup from your New Orleans hotel. Travel with your small group by van along the shores of Lake Ponchartrain as your guide shares facts and stories about plantation culture. 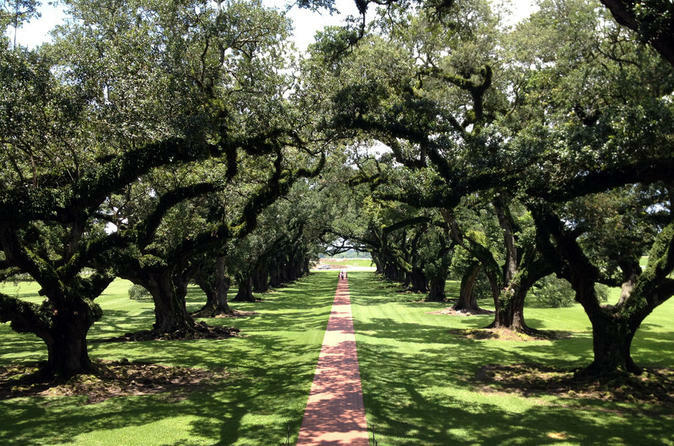 Head along the Great River Road on the shores of the Mississippi to Oak Alley Plantation. During your 1.5-hour tour, admire the mansion's Greek Revival architecture, and listen to guides in period costume talk about the lives of those who called the plantation home. Afterward, enjoy some free time to walk under the spectacular canopy of 28 giant live oaks on the plantation grounds. Leave Oak Alley and continue along the Great River Road. Pass Whitney, St Joseph and Evergreen plantations and learn about their histories from your guide before arriving at Laura Plantation, a lovely Creole plantation surrounded by sugarcane fields. After seeing the mansion, explore the outbuildings and lush flower and vegetable gardens. Your 1.5-hour guided tour finishes up in one of the slave cabins where the West African folktales that inspired the Br'er Rabbit stories were said to be recorded. Following your tour of Laura Plantation, reboard your van for the ride back to New Orleans. Your 6-hour Louisiana plantation experience ends with drop-off at your hotel.